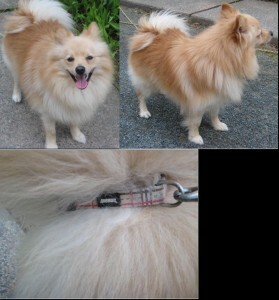 I believe this may be the dog that my husband frightened off while trying to catch in our back yard two evenings ago (a little closer to Sackville along the Beaver Bank Road) Not long after that a gentleman was walking along with a flashlight from Woodbine looking for the same dog. Husband’s not around so I can’t get the details at the moment, but with luck the pair will be reunited soon! Skittish thing? The owner said he’s new to the area and doubted the dog would be brave enough to come to anybody. This is such an awesome site. This is our dog that was found and we are so thankful to the people who cared for him while he was missing. It is great to know that there are so many people out there who do care and will take the time to catch the dog and look after it till the owner is found. Dog do get away on owners once in a while, it just happens, so a big thank you also to all of you out there who do genuinely care for our smaller kids. I would do the same in a heartbeat.